Every sale transaction is defined as complete when the seller issues a bill of sale to the buyer. This holds true for the sale of a boat too. When a seller sells a boat to a buyer, he is required to issue a boat bill of sale which defines the complete characteristics of the boat and other details like its cost, make etc. 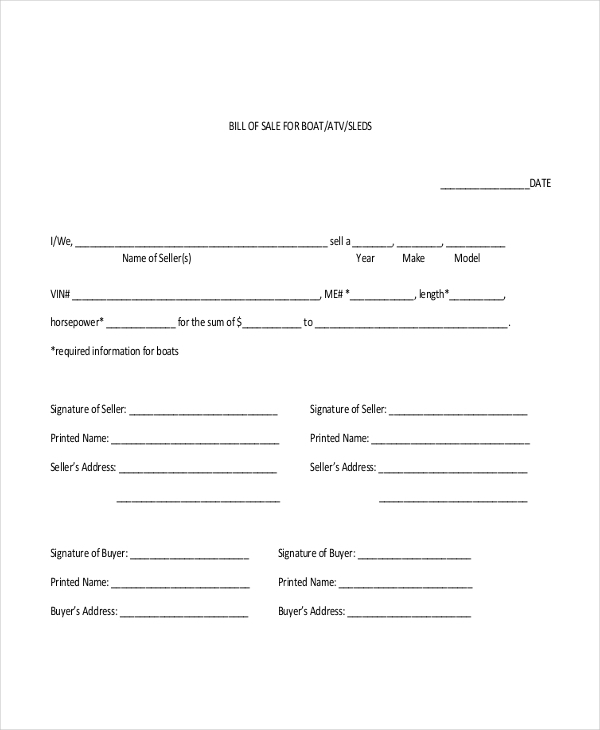 The seller can make use of Bill of Sale Forms to design such a bill. A showroom that specially deals in the sale for boats along with trailers can make use of this bill document to come up with a unique bill design for themselves. This form includes all the important segments that describe the boat and trailer as well as the sales transaction. 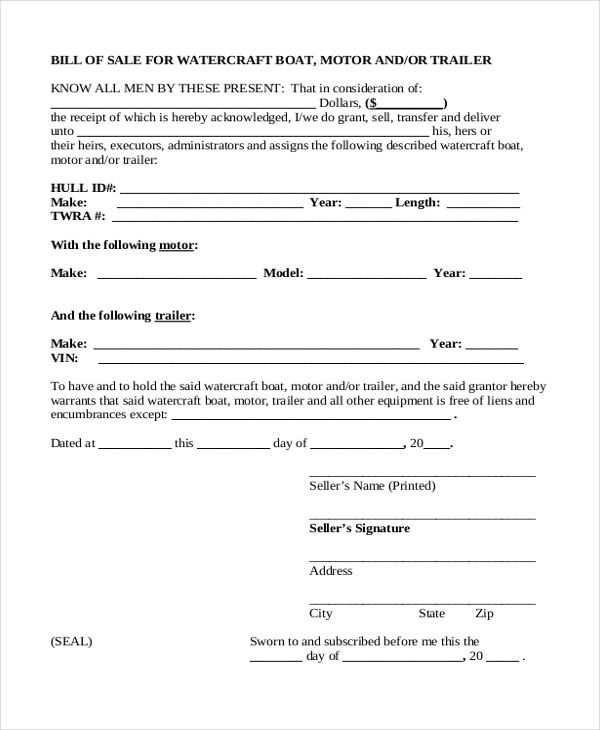 A boat dealer can use this form to get a cue about the format to be followed when designing a bill of sale for a boat. With all the crucial segments and subheadings in place, the seller can easily personalize the form to give it a unique design. 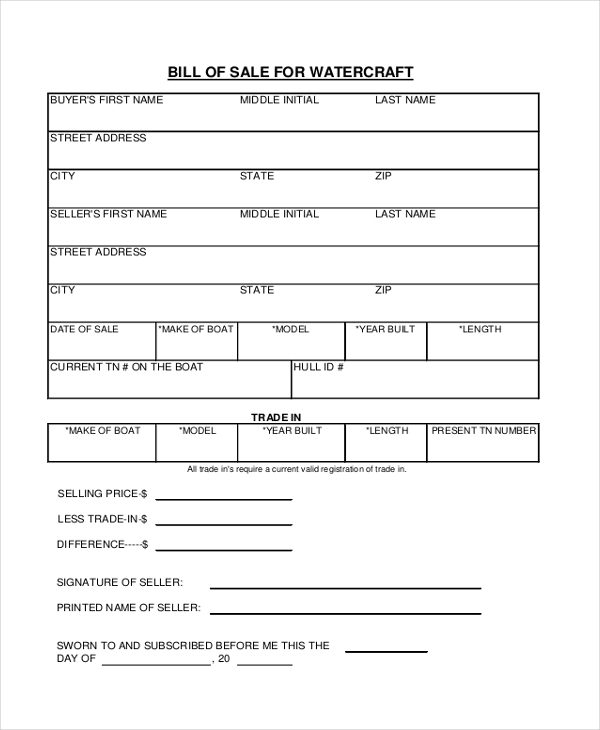 This bill of sale can be used by any boat dealer or showroom. As the name indicates, it comprises of all the basic segments that should be included in such a bill document. The user can further make changes to the format as per his needs. You may also see General Bill of Sale Forms. 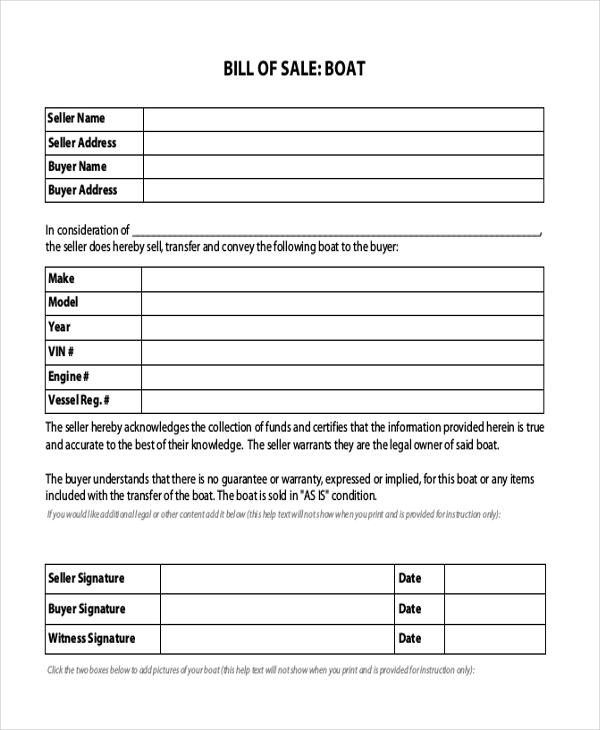 This is a sample of a boat bill of sale and gives the user an idea of the format to be followed when designing such a form for his organization. He can use the defined format just the way it is or can make changes to it as per the requirement of the sales transactions. This is a print ready boat bill of sale and can be used by anyone irrespective of the types of boats he deals in. The format followed in this form is one that is acceptable in all states and countries. However, if required, the user can customize the form before getting it printed. You may also see Equipment Bill of Sale Forms. 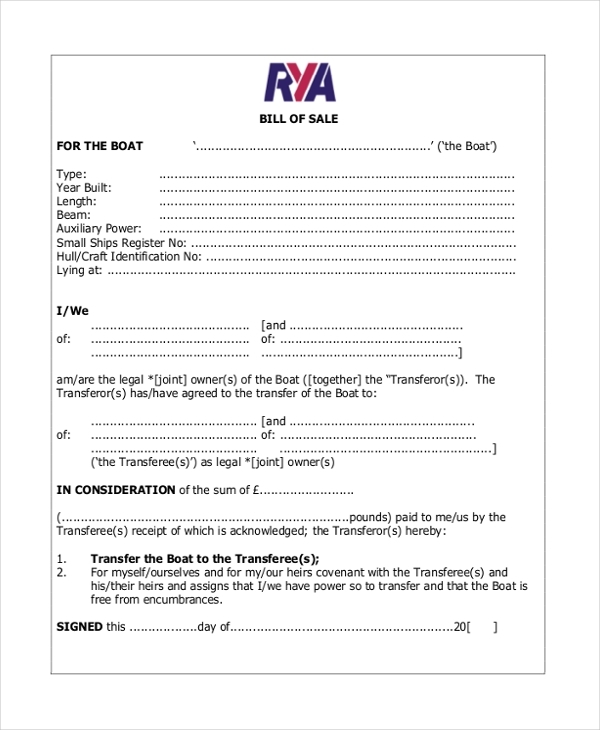 This is a general format of a bill of sale and can be used by a person who may be thinking of designing a boat bill of sale for his/her organization. With a format and all essential segments in place, designing a unique bill seems like child’s play with this form. As the name indicates, a showroom or dealer who specializes in the sale of watercrafts can use this form to come up with a bill of sale. This form contains all the subheadings that come in handy when defining the characteristics of watercraft. You may also see Equipment Bill of Sale Forms. 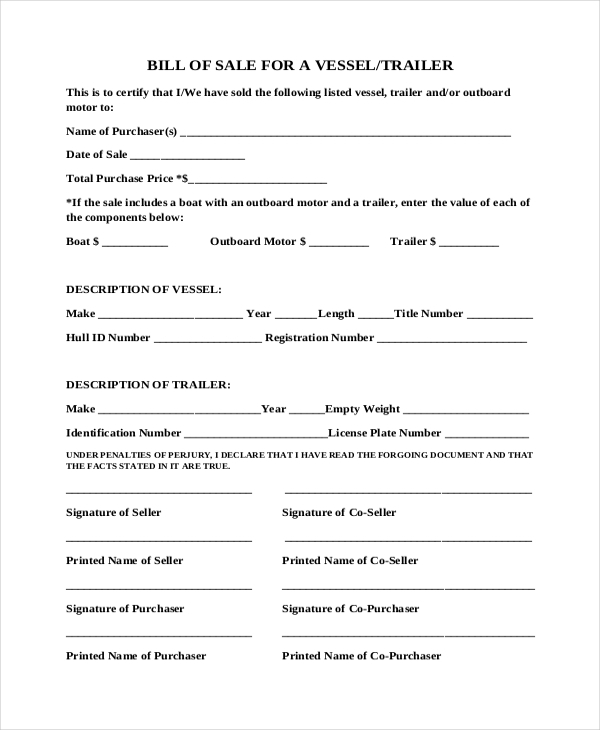 When a seller wishes to include the clauses, to transfer the ownership of the boat to the buyer within the bill, then this bill document can come in handy. It contains all the segments as well as clauses that help in guarding the whole transaction. You can also see Sample Bill of Sale Forms. 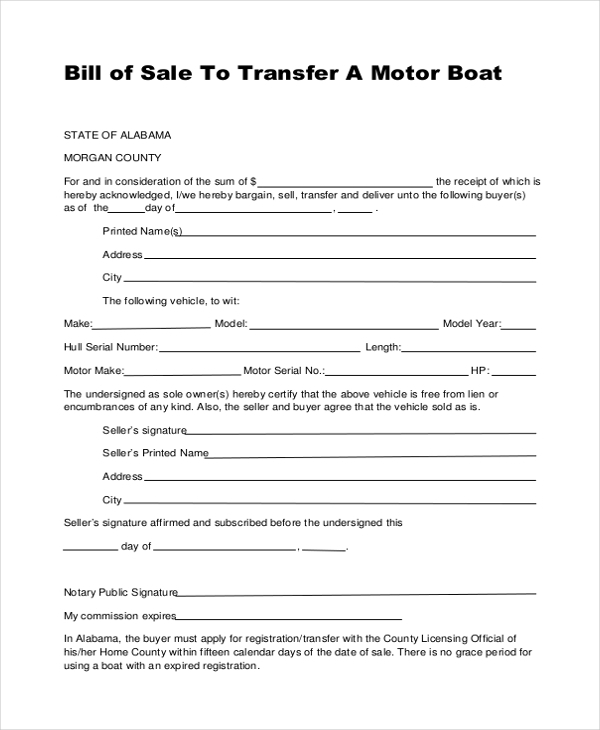 What are the Benefits of Using Boat Bill of Sale Forms? In case you are not sure how to design a boat bill of sale for your organization, don’t worry. Just take a look at our wide collection of the blank bill of sale forms to find the one that will be perfect for you. Download this and customize it as per your needs. 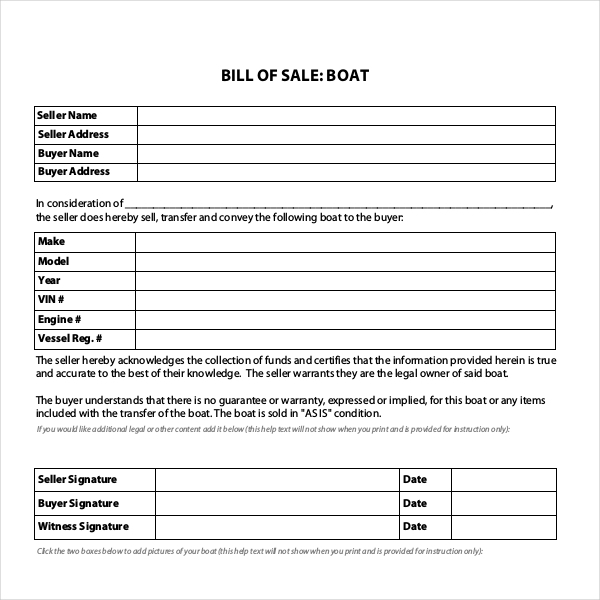 Available in MS Word and PDF formats, these forms help you to design a unique boat bill of sale within no time. You may also see Bill of Sale For Cars.